As the largest social media site, Facebook has approximately two billion users, which makes it an ideal platform to talk to numerous individuals at one time. 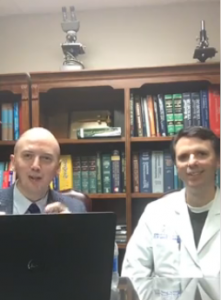 To help patients become more informed about their bariatric surgery options, Dr. James Parrish recently posted his first Facebook Live video on June 6th, which was recorded at Christus St. Frances Cabrini Hospital. In the segment, called “Ask the Doc,” Dr. Parrish answers user-posted questions about weight loss surgery, from candidate requirements and age limits to financing options and insurance coverage. He also reviews how bariatric surgery can reduce complications from common obesity-related diseases, including diabetes and heart disease. And then goes on to discuss the latest techniques in weight loss surgery, most notably the ORBERA® intragastric balloon. The 20-minute segment covers a lot of ground, and we hope you can take some time from your day to view the clip. If you have questions about bariatric surgery that are not addressed in the segment, please contact our practice for more information. Our next free weight loss seminar on will be held on July 27th at 6 PM, and we hope to see you there.